Between all the jump scares and creepy animatronics, it’s pretty easy to miss some of the easter eggs and smaller details hiding in Five Nights at Freddy’s 4. But they are there, waiting to be noticed. Better yet, they might tell a pretty disturbing story about what’s ‘really’ happening inside of the game. Here are the secrets that players around the web have found in Five Nights at Freddy’s 4. Spoilers for story-related stuff follows! 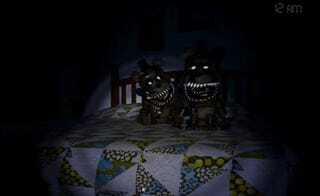 Lets start with a few related ones that appear when you turn around and face your bed. No, I’m not talking about Freddy’s honk nose, though that’s an easter egg you can click on, too! The thinking is that these items prove there’s something more going on than what meets the eye. Interpretations vary. There are some people who say these items mean you must be in a coma, and everything happening inside of the house isn’t real. Others posit that you are merely in a critical condition, hence items that you might find at a hospital. You’ll have to turn up your volume for this one. Around the 6:58 mark in this video by Adam Sklar, you can hear a heart monitor flatline—it’s possible that by the end of FNAF 4, your character actually dies! Other players have corroborated this by noting that the file itself is actually named “hospital flatline.” This secret also furthers the idea that you might be in a coma or a critical condition at a hospital. Those pictures in the hallway? That’s proooobably the developer and his family, or so the internet is convinced. After beating night 2, you are instructed to move forward in a mini-game. 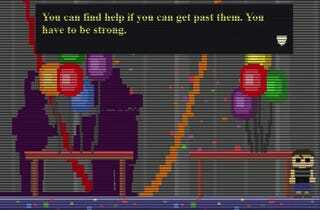 But if you happen to double back instead, you’ll catch a glimpse of Purple Man helping someone into a suit. In case there was any doubt: yes, Purple Man is an ex-employee of Freddy Fazbear’s! Everyone speculated that the ending of Five Nights at Freddy’s 4 proved that this was the bite of ‘87. Between other clues that players have picked up on and this easter egg, it’s starting to look like that might not be the case at all. In the mini-game following night 3, if you stick around in the living room, the monitor will play a broadcast. Surprise: it’s 1983 (or perhaps a re-run from 1983?). Just how many times have people gotten bitten in the head by a Freddy animatronic, anyway? Geeze. Phone guy might not brief you in FNAF 4, but he’s still in there. Really. Sometimes, the game will randomly play a static-filled sound effect, which you can hear around the 2:00 mark of this PrettyGrumpyBear video. Players reversed the audio and found that it’s actually a clip of phone guy, from one of the earlier games. Right now, it seems like it’s just there for ambiance—nobody can find some story-significant reason for it being in the game. Might just be Scott Cawthon, the developer, being thrifty with his sound effects. 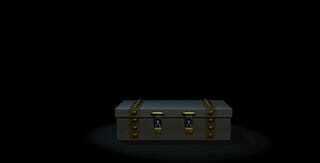 After you beat the game on nightmare mode, you are treated to a screen featuring the box above. “Perhaps some things are best left forgotten, for now,” the game says. The question on everyone’s mind is of course: what the hell is inside the box? There are theories. Some think that it’s a tease for whatever Scott Cawthon is planning on dropping on Halloween for FNAF4. Others are convinced that you can open the box up if you just input the right code—you can actually click on the locks and they’ll jingle, as they do in the GIF above. Maybe if you click them in the right order, something will happen? People are scrambling to try to figure out the mysterious code neccesary. It might be a wild goose chase, but some savvy players note that the game’s code does account for the possibility of opening up the box. According to Redditor GobbleMyPot, the decompiled code says that opening the box unlocks something called “deep9,” something that is supposed to appear in the extras menu once you unlock it. So far, people have tried lots of the obvious possible codes, but no dice. I just hope that whatever is in there is worth all the effort of trying to open it. Secretely, I want it to be a teaser for Chipper & Sons Lumber Co 2, because that would be hilarious.